This fabulous book has been written as a prequel to the highly acclaimed TV series Luther, by the same author. Neil Cross, although more widely known for his TV and film writing, has also produced several other successful novels and was long-listed for the Booker Prize for one of them in 2004. 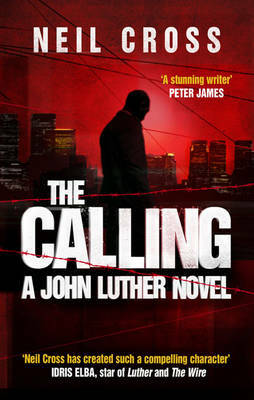 THE CALLING has also been long-listed for several awards, including the Theakstons Old Peculiar Crime Writing prize. If you are familiar with Lutherfrom the TV then you are going to enjoy this book, as it sets the scene for everything that follows. It details the case that finally tears his failing marriage and professional relationships apart and explains why he behaves the way he does. To give you a taster, a rather unsavoury character, called Henry, is on the lookout for babies to "adopt". He will stop at nothing to achieve his ends, even ripping an unborn child from its mother's womb. John Luther is particularly distressed by this case. Unable to sleep, his mind is on overdrive, looking for a solution before more people die. The darker side to Luther's personality pushes him to obtain information at any cost. His methods for acquiring this information are not exactly kosher, and include physical violence, harassment and bribery. There is nothing he is not prepared to do and, as he gets Henry within his sights, his anger and frustration boil over and push him right to the edge of his sanity. This book is my first exposure to DI John Luther and his brooding, dark fury is right up my street. In fact, such was my degree of involvement in the story that I have purchased seasons 1 and 2 of the Luther series on DVD!